The sun was bouncing off the cars, the lawn mowers were going, the daffodils were blooming...oh yes, the signs of spring are starting to appear. I even got to whip out my sunglasses. With that spring feeling in the air, this is what I chose to wear. 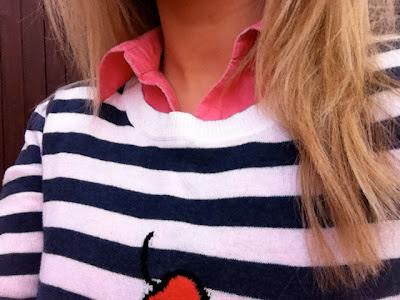 I layered a fun jumper over a pink shirt and paired with jeans for a bit of a fun but preppy look. I seem to be going through a shirt under jumper phase at the moment. Anyone else currently going through a phase of something? I threw on a pair of burgundy coloured sunglasses and heels to complete the look. Jumper (Topshop), Shirt (H&M), Jeans (Topshop), Shoes (Marks & Spencers), Sunglasses (Warehouse), Clutch (River Island). Cute sweater! It's cheeky and fun. the jumper looks cosy and very cute. So does your blog!! keep posting, please!! I'm a fan!! That is such a cute sweater! I absolutely love the color of that clutch. a wonderful outfit! the sweater is sooo cute!! and i really love your blog - I'm a new follower via bloglovin! If you find some time, I'd be so happy if you visited my blog too!!! awww I love your sweater! It's so cute! What a beautiful jumper!!!! :) U look so sweet! !